I just got done watching Hitman for the second time. Lately I've really been into the military, assassin type movies. 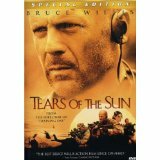 Tears in the Sun was another one I watched a couple times. Not sure why except that something is rolling around inside my head, like it's trying to get out. In the way of a story, of course. It's not clear yet but there is something definitely trying to take shape. Anyone seen either of these movies? I haven't seen either of them. A few years back when I saw advertisement for the video game version of Hitman it reminded me of the movie The Transporter with Jason Statham. If you haven't seen that one you might like it. They made three of them, but I only saw the first one and enjoyed it.